Sister Salter is back on the case. The Mystery Play is the second installment in the Parrsboro trilogy, a series of mysteries commissioned by the enterprising Ship’s Company Theatre. 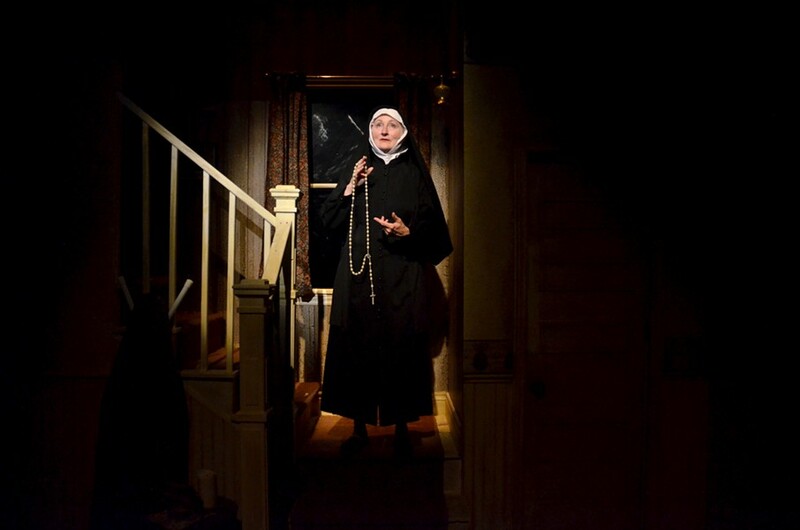 The plays share the main character of Sister Vivian Salter, a nun with a penchant for sleuthing, played with pluck and aplomb by Mary-Colin Chisholm. This play has Salter doubting her faith and returning to her childhood home to care for an ailing father, beautifully portrayed by Don Allison. A young couple (Micha Cromwell and Henri Gielis) has also moved in, and things start to go bump in the night. Is there a ghost? Is someone sleepwalking? A possession? Staging a mystery is no easy task, and the intricate set, lighting and sound design do a good job of maintaining a creepy vibe, but the play relies too much on exposition at the expense of showing action onstage. While there are some fun surprises as the mystery unfolds, the execution often feels laboured, with awkward blocking and numerous monologues and asides that would have been unbearable in the hands of a lesser actor than Chisholm. The ultimate reveal of the show also has such a tenuous connection to the characters, that the payoff feels mostly unrelated to what came before. It is ultimately MacDonald’s script that focuses too much on explaining a mystery instead of showing one.